Hinckley United's Matt Gadsby died after collapsing on the pitch during a Conference North game on Saturday. The 27-year-old defender fell to the ground with no-one near him during the first half of their game at Harrogate. A statement from Hinckley chairman Kevin Downes said: "This is an absolute tragedy and our thoughts are with Matthew's family and friends." Gadsby joined Hinckley on a free in the summer from Forest Green having started his career at Walsall as a trainee. He also played for Mansfield Town and Kidderminster Harriers. Downes continued: "Incidents like this put everything into perspective and no-one can quite come to terms with what has happened. "The medics were on the pitch within seconds and their treatment was first-class and they did everything they could along with the staff at the hospital which was next door to the ground. "Matthew had made a big impact on the football club during his time at the Marston's Stadium and he will be sadly missed by everyone." 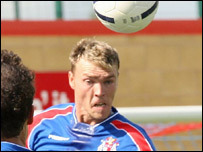 Gadsby joined Hinckley on a one-year contract this summer and leaves behind a young daughter and wife Sarah. Hinckley's match away to Moor Green on Tuesday night has been postponed as a mark of respect.